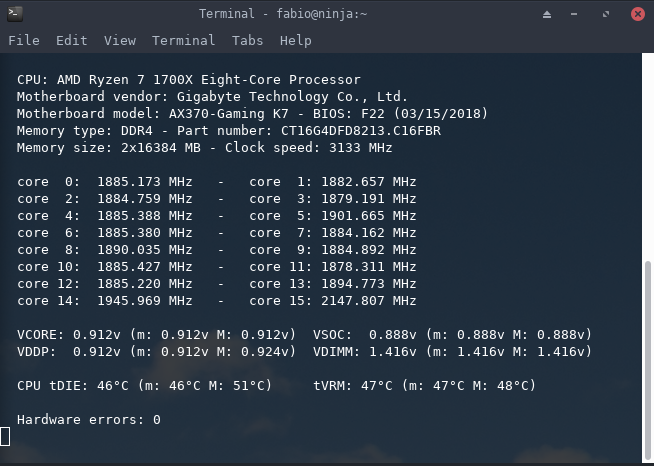 AMD Ryzen-info is a small Python script I wrote to monitor the main hardware system information of an AMD Ryzen system running on a recent version of Linux kernel. It relies on dmidecode and lm_sensors to gather the needed information, to get correct voltage and temperature readings it is critical that the most up to date version of the it87 kernel module is installed; Python version 3.5 or higher is also hard requirement. dmidecode requires to be run as root and so does Ryzen-info since it relies on it to gather DRAM related information.